A Few weeks back one of my employees, Ciaran, said to me “Have you heard? Google is going to hold back keyword data in Analytics?” My reply? “Ha! That’s ridiculous, they would never do that. That would be shooting themselves in the foot”. Ciaran, I owe you an apology. Although they are not really shooting themselves in the foot, more like sawing of their foot and leaving it in a box with a grenade. Saying I’m outraged is an understatement, but I’m probably more shocked that there is not more noise in the internet marketing industry (especially SEO) than it is. People wake up, Google is lobotomising us! Using analytics is an Internet Marketer’s MI 6 – our intelligence service. Knowing which keyword converts is in essence our bread and butter when it comes to SEO. THIS is what is being taken away! Google are holding back (by encryption) the organic keyword data in Google Analytics (and any other analytics for that matter) for ANY users logged into a Google Account. They are doing this by making SSL default when you are logged in to a Google Account. Basically any visitors from Google organic/natural search listings will NOW be registered as ‘not provided’ in your Analytics. Although this doesn’t happen if the user isn’t logged in, or of course use another search engine. BUT still, this can mean a high percentage of your organic traffic that you in essence now will be “blind” to you. Below is an example of State of Search Google organic traffic for the past couple of weeks, the number one keyword? “NOT provided”! The official card they are playing is “privacy” , being Google and doing ‘no evil’ they are simply helping their Google customers (that are logged in to their Google account) protect their privacy. Really? Pot, kettle, black? * To restrict amount of keyword data to ad re-targeting companies and increase spend on their own ad stream. It’s perfectly plausible and possibly understandable that Google wouldn’t want other companies to capitalize on their traffic intelligence but I think this theory is less likely. This isn’t big enough reason to hold back this data and face the wrath of the marketers and other analytics users. The win needs to be bigger. * To encourage more Google AdWords spend as the filter doesn’t apply to PPC traffic. Although technically this would make sense this theory again wouldn’t make them enough money for the risk to be worth it. * They actually want to offer better privacy and want to make search more secure. Uhu, yeah, mmm..
* Monetising Google Analytics. Encrypting the keyword data would be the perfect way of lining up a enhanced feature analytics package, between the free and the enterprise. There needs to be a reason why people would pay for Google Analytics when they’ve had it free for so long. In fact this theory is my bet! Google has long had plans to monetise Analytics and to be fair they would be stupid not to, BUT to pretend it’s for their users greater good and privacy. Which to me is “male cows excrement”. What is your theory? How has it affected you and your customers? * Check out Chris Lake’s blogpost on the issue on econsultancy for further examples of the filter in action. If you do exactly the same but with the new style of Google Analytics and then compare the results over the same date range you should see a lot less visits. I am seeing an extra 2312 visits appear in the old style of Google Analytics compared to the new style with the same page and settings. The extra visits appear as (not set). It looks like a bug, but could it be data they are hiding or am I thinking about it a bit much? I would really appreciate it if someone else looked at it. 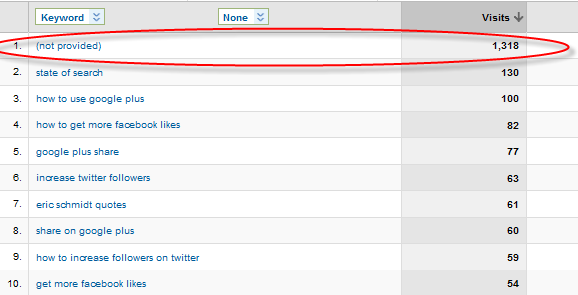 I know you can find out more about the (not set) traffic but why is not appearing in the new style Google Analytics? Have they missed something out in the old style? not seeing this.. both figures tally up on our sites.. although i am seeing other discrepencies between the old and new interface. Thanks must just be me then, how strange. Google is moving towards eliminating the ability to perform SEO and the PPC management game. Back when I owned bidangle… a large Internet Marketing Agency that focuses on PPC management, Google told us and many others, “We’re not interested in getting involved with PPC management at the agency level.” Not even two years later Google was calling on our largest clients offering to manage their AdWords accounts for free! Luckily… most our clients didn’t trust Google and didn’t take them up on the offer. I always replied with, “why not?” If they’re decreasing your cost per acquisition and increasing you’re market share… what’s there not to trust? In any event, the writing was on the wall for PPC management and SEO for a few years now. 10 years from now people will be saying… what the heck is SEO! its a pain, and yes were already seeing this ‘nor provided’ data in our analytics. However, by doing this in trying to encourage people to use adwords more (as adwords isnt affected) they are in essence alienating people to the very product they are trying to promote. I’m already steering certain clients clear of adwords and onto things such as facebook advertising and Bing, purely becase google adwords is turning into a joke. High CPC prices, poor quality scores based on circumstances out of your control, and other issues and causing me to get fed up with it and i’m looking elsewhere for good PPC. Hopefully, google might realise that by forcing adwords upon us, they are in fact steering us away from it. I believe if your whole website is https: then it will show this data, in the process of testing this but i heard it from a reliable source so i am quite hopeful. & if Google killed SEO then it would end up cost them in a fortune in process power. Unless users with Google accounts only buy ‘green widgets’ and non-logged in users only buy ‘red widgets’ we will still know which keyword converts at the higher rate. I agree that it will take some data away but hopefully the ratios will stay the same so we will still be able to analyse convertion rates. For instance if the keyword ‘green widgets’ converts at 10% and ‘red widget’ converts at 20% then analytics will still report this for non-logged in traffic. I would agree and hope it is the later – monetising Google Analytic’s. I am still in shock they have actually done this. I was on a didgy free holiday and was told about this when I came back. Well not exactly but it is an inconvenience we could do without. I am living in the hope Google will bring out a mid tier analytic’s package that will be affordable to small and medium sized businesses. Its a no brainer on Google’s part to be honest. Up until now, there has been no way for a webmaster to track a keyword back to an individual. At the time of this writing there still isn’t — but it’s coming. And it’s coming soon. Google is about to seriously beef up their Google+ API. If it works like the Twitter / Facebook APIs (and I suspect it will), then it will make it possible for API developers (like myself) to access at least part of your profile data whenever you hit my site and you’re logged into your Google account. If your keyword data was passed through when you hit my site and you’re signed into your Google account, then I (or anyone) could write a simple program with the API that could grab your name, and tie YOU back to the search that brought you to my site. Once I have your data, there is no stopping me from logging that into a database and publishing it wherever I want to. This could be used for humiliation purposes. It could be used for blackmail. It could be used to really cross the line of what you would want anyone to know about you. In short, Google is 100% right about doing this. I only wish their explanation was more honest. The changes in the Analytics are killing me! I suddenly feel blind to be able to supply my visitors with the right content and make sure I’m making the changes i need to drive my business in the right direction. It’s like someone turned off the lights suddenly…it’s such a challenge. I have been pondering daily how I will determine what my visitors are shopping for, looking for, etc. etc. I’m sure you are all experiencing the same anxiety. My question is…what is the work around? There’s got to be one! I mean…what’s a different way to look at the data we do have, to make the kind if determinations about our traffic? Im rackin my brain here thinking I had better get ready to change my ways as my traffic information dwindles on me. I can’t stand it! I hate that they are the only game in town..that really matters, that is what pisses me off the most. I’m not sure of what my back up plan is. I hate not having a back up plan. What Modi says makes perfect sense, but it makes me want to stay logged OUT of my Google account. Would love to hear your ideas and back up plans..I’m coming up empty! nadine.. what you’re visitors are shopping for and looking for isnt supplied by the keywords in analytics anyway. Site search and nav tells you this… if thats all you’re after. This may not be such a blow as we all think. The keywords in analytics only tell you how they landed on your site.. but these could be completely irrelevant ! or they could be spot on depending on how well you’re doing other jobs. However, whats important is how your visitors convert once they are on the site. I guess what i’m saying is that knowing what keywords refer visitors may not be that important to your final sales figures. I know this kinda goes against what we all know, but when you break it down, do we really use keyword data that much from analytics? Really? or do we focus on site performance? In e-commerce sites… you need to know several things. Whether or not you are positioned for terms relevant to your products and that people are searching for. What pages are failing to retain visitors. Your sales and conversion data. However, knowing whether 10 people converted from ‘short brown trousers’ or ‘short legged brown trousers’ really doesnt make one bit of difference to your final sales. How will knowing that information help your page? Just because you get a sale from ‘short brown trousers’ and not ‘short legged brown trousers’ may simply mean that your site isnt focused on ‘legged’ or that the term only gets 10% of traffic, and thus will convert at a much lower rate. I know we all know this, but what i’m saying is that keyword tracing isnt necessary to measure performance of a site or its pages. It wont help you focus your pages, as ultimately your pages provide the keywords anyway..
Its kinda hard to explain what i’m getting at.. but basically, your site provides the keywords you are found for.. not the visitors. Work on your site, focus it, improve it, and you wont have to worry about them. Referral data from such searches has I think long been inaccurate. Most folks now use other tried and tested methods of establishing “gold mine” keywords and optimising for landing pages etc. Google usually gets round any issues by claiming protection of privacy. We know this to be untrue, when the boundaries of privacy are widened on what seems like a monthly basis, especially when we consider the likes of street view, which will now be accessing buildings internally. Confidence is already sufficiently knocked with regard to dilution of keyword volumes displayed through the Global Networks in any case. Some people might think they are ranking well for (Not Provided). Off to search it in Google. @Tom: Ok yeah that’s true, I know a lot of agencies that got very hacked off when Googel started approaching brands directly. Luckily for agencies they had and still have issues in servicing quality, a lot of the “optimisation” staff where lets just say “not that good” and the brands quickly came back to the agencies. @Kes: Maybe but I rather know the exact numbers to be honest, and more importantly, so does my clients. Would you spend money on PPC and just get PART of the data? @Nadine There is not much we can do at this point, but I’m sure there will be work arounds. You can like suggested above transfer to https of course but its a bit of a ball ache. Sorry @Dan missed your comments inbetween the ping backs. Good point about Streetview and backs up my “pot, kettle, black” comment about Google 🙂 I do think this data will be missed though, even if it’s just the “striker” data. Oh and with Striker data I am refering to Converting keywords. It’s a bit like hiring just strikers in the football team and think they will score loads of goals, you still need the winger, midfielder and so on to convert a goal…haha goal, see what I did there..Need a drink.. Thanks Lisa ! LOL Yep agreed. All strikes about lining the search engine pockets too. you talk as if Google owes you something. The smart SEO’s arn’t complaining because they are Investgating how they can use it to their advantage. Okay… lot’s of rumors in here… let me shed some light. There are alternatives to Google Analytics. And they provide you with all the information Google doesn’t. Find a program that translates your web log files into usable charts/graphs/stats. A, they’re much more accurate than Google. B, you learn all that private stuff that Google hides. And guess what, your reporting ability is now independent of Google’s policies and practices. Personally, I use several tools to aggregate meaningful data – including Google Analytics. If I can’t find the answer through them, then I simply switch tools and I’m back up and running. What’s better, if you know just a little SQL, you can take one of these log readers and create your own reports. Feed the data to XML and use a visual graphing plugin to display some pretty neat stuff. Additionally, you can pull your data from the Google tracking cookie, throw it into a database with your log files data and all of a sudden, connect the whole system to your business systems database – now that’s power. You can track a lead/sale all the way from the very first visit to your site and the keyword origination – automatically! We get everything we need from a program called Whoson – http://www.whoson.com – and no, I don’t work for them or have an affiliate link for you. It’s just good stuff hands down. Jared, google is not passing on referrer data so this affects EVERY analytic provider. Not just GA. I have just started building my website at BestFreeNet.com and this is really hurting me. I am just now working on SEO and I get very little organic search traffic. I get less than 10 or 20 hits a day from google search and 100% of those searches are “not provided”. This is really frustrating since my site covers free products and services that can be found on the internet in just about any topic. So i have no way of knowing what is bringing people to my site or which topics are the most popular for me to improve on. Same on you Google I think this was a horrible move. Lisa your suspicions were correct – I just found this about GA premium – a mere £90,000! So annoying. Now I literally cannot track which keywords turn into sales. Very disappointed in Google. Surely there is a better way to protect users’ privacy. I mean it’s not like we’re getting the search query along with user name and address is it? Time to start moving to self hosted analytics options! I’m afraid that’s not an option, Google searches are now https, meaning the referer urls that previously contained the clean search keywords used by self hosted analytics apps on the server side to gather data are no longer available, and that applies to ALL google searches for both signed in and signed out users. Google have effectively killed another part of the SEO industry, the self hosted server stats/keyword analytics apps are now as good as dead. In terms of keyword search volumes all we have left is Adwords data, and that’s hardly to be trusted for SEO, afterall, to Google, it’s all about the money..